Mindless vandals have destroyed play equipment at a Glasgow nursery leaving the toddlers who use it devastated. Two evening events this week will provide information on proposals for improving two of Glasgow city centre's nine districts. Full details on the Glasgow results in the Scottish Local Government Elections 2017 can be found at the 'Elections and Voting' pages of the council website. More than 60 Glasgow school pupils staged a mass clean up on the city's south side before enjoying a tour of Hampden Stadium and the Scottish Football Museum. 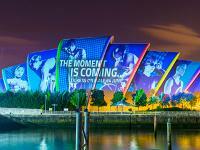 Tickets for the Glasgow 2018 European Championships - a brand new event on the global sporting calendar - will go on sale to the general public from Wednesday 14 June. Glasgow has today sent its condolences to the people of Manchester in the wake of the terrorist attack at the Ariana Grande concert.